I‘ve stated more times than I dare count that I abhor Conspiracy Theories. Claims that “9/11 was an inside job” belong in the same rubbish bin as Sasquatch and Elvis sightings. 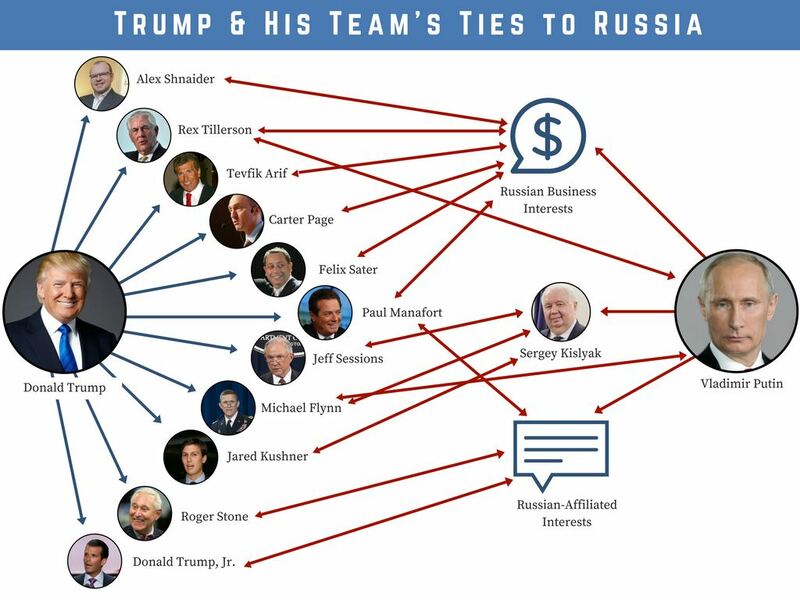 But the evidence of links between the Trump campaign/White House and Russia (for whatever reason) are documented fact (often by photograph and peoples’ own admission) and continue to grow so fast, it is getting harder & harder to keep track of them all. So I’ve decided to start a list of people & events linking people connected to Trump (including the man himself) to Russia (and US/Russia policy.) I’m not positing “why” any of these people chose to come in contact with whatever Russian official/billionaire/oligarch for whatever reason, nor do i wish to draw any nefarious conclusions (not this post anyway) as to their goal. This is simply a list. Make of it what you will. It’s mere existence and length should raise eyebrows if not concern. “I have no deals that could happen in Russia, because we’ve stayed away.” – Donald Trump press conference, January 11, 2017. I keep hearing from so many Trumptonians who get a huge asinine belly laugh from any suggestion that Russia may be meddling in our Democracy (“My PopTart is stale! 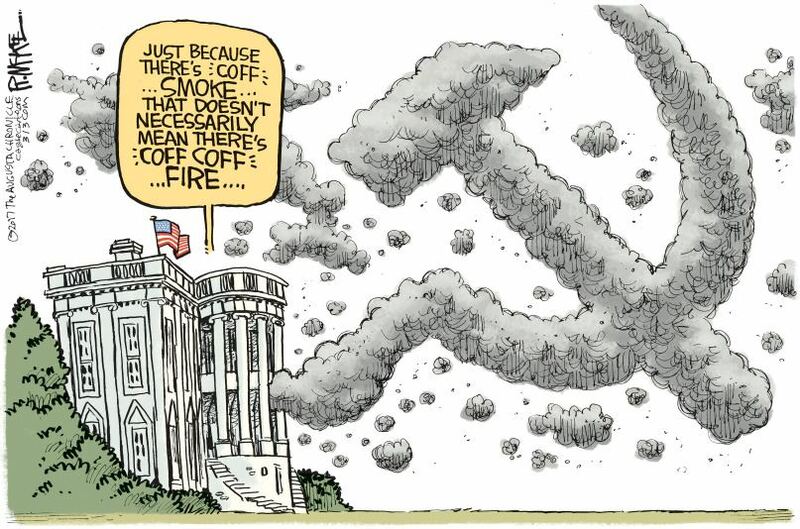 Blame Russia! Har! Har!”) Unless someone truly adores Russia and/or Putin, I can’t fathom for the life of me why anyone would rush to defend him/them, belittling any suggestion that Russia is anything but an innocent victim being targeted for character assassination by our “evil” Media. The closest I can fathom is some revulsion that… if true… it somehow benefits Hillary and/or could somehow miraculously make her president. I understand why you despise Hillary (okay, maybe not to your insane degree, but I did after-all write-in Bernie rather than vote for her), but this head-in-the-sand ridiculousness of dismissing evidence sight unseen that a dangerous & corrupt foreign power led by a brutal power-mad former KGB agent that has his critics locked up and/or murdered, may be… not just meddling but actually SHAPING U.S. policy to our detriment for their own personal gain… astounds me. After being accused of being a “traitor” during the eight years of the Bush Administration for not supporting his dangerous policies and corrupt government, I have no stomach for ridiculous borderline-traitorous fools who can’t set aside their hatred of Hillary… now extending to disdain for our own Free Press and First Amendment… long enough to examine mounting evidence that another country is manipulating the U.S. government from INSIDE the Oval Office! I’m just curious what part of “the Russian thing” don’t they believe? Trump’s inexplicable fanboy love of Putin (even criticizing the U.S. to defend him)? 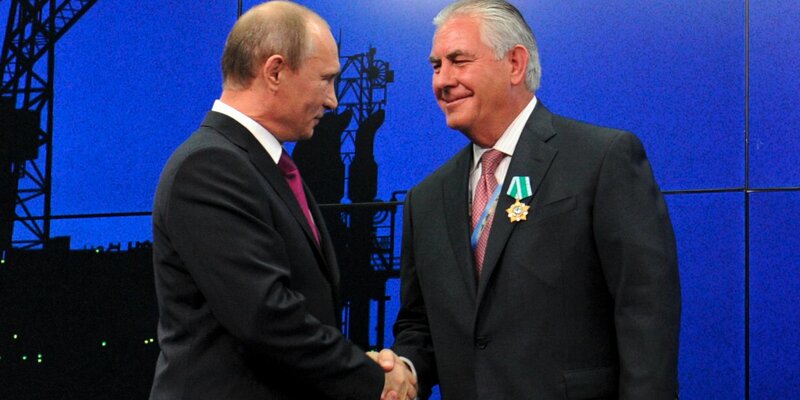 The fact Trump appointed a man whom he had never met (Exxon CEO Rex Tillerson), someone who has had a friendly working relationship with Putin since 1999 and received Russia’s highest civilian honor, the “Medal of Friendship”, from Pootie himself… to be our Secretary of State… running a department whose primary job it is to aide/develop U.S. allies around the world and make life miserable for dictatorships like Russia/China/North Korea (and whose budget Trump now wants to cut by 37%), after not even being on Trump’s initial short list of nominees? Or what about appointing a lobbyist for the Russian government… Paul Manafort… someone who had NEVER run a political campaign before, and is suspected of laundering tens of millions in Russian crime money… to run his presidential campaign? Starting from the very beginning, as noted above, Trump’s second campaign manager Paul Manafort (hired after Corey Lewandowski was fired upon revelations of spousal abuse) was forced to resign when it was discovered that he lied about having worked as a lobbyist on behalf of the Russian government in Ukraine and was paid millions of dollars at a time the United States was vociferously condemning Russia’s attempts to annex Ukraine. After his resignation, it was discovered that Manafort has also met with Konstantin Kilimnik, a Kiev-based operative with suspected ties to Russian intelligence, in April of that year (as well as at the Convention in July). Kilimnik had worked for Manafort as a Russian liaison a full DECADE in Kiev before Manafort offered his services to run the Trump campaign for free. A Washington Post investigation revealed that the Trump campaign demanded the removal of any pro-Ukrainian plank from the GOP’s Convention platform. 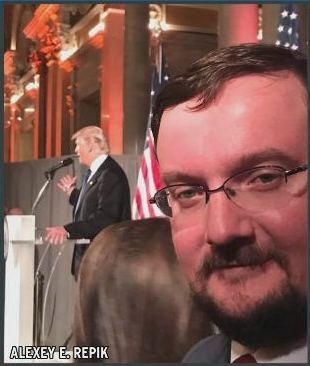 Former Trump campaign official J.D. Gorden said it was Trump himself (at the urging of Manafort) who personally demanded support for Ukraine be expunged from the GOP platform. Before the Convention, Republicans were VERY pro-Ukraine, with some even demanding we arm the Ukrainian rebels against Russian forces (particularly after Russia provided SAMs (Surface-to-Air-Missiles) to pro-Russian Ukrainian rebels who then shot down a Dutch passenger jet killing all 298 people on board. No explanation for Trump’s request was ever given. Instead, the Russians MAY have been assured that sanctions imposed upon them for these activities might be lifted under a Trump Administration. In 2008, John McCain declared, “We’re all Georgians now” after Russia invaded the former Soviet nation of Georgia. In 2014, the GOP took the side of Ukraine after Russia annexed Crimea, even calling for the U.S. to arm the anti-Russian rebels. Now suddenly, we are chummy with Putin and Russia’s is behaving as if we might lift those sanctions on Russia. More recently, we have the case of former Senator turned Attorney General Jeff Sessions, who volunteered during his confirmation hearing that he had not spoken to anyone in the Russian Government while he was associated with the Trump campaign. In fact, Sessions HAD indeed met with the Russian ambassador twice during that time. He first stated that his meeting Ambassador Kislyak was so brief and inconsequential, it simply slipped his mind (not a quote). And maybe it was a brief encounter or simply part of his duties as a member of the Armed Services Committee, but he could simply have said he never met with anyone “on behalf of the Trump campaign” or “only as part of my duties as Senator”. But he didn’t. He simply denied having ever spoken to “anyone” working for Russia. 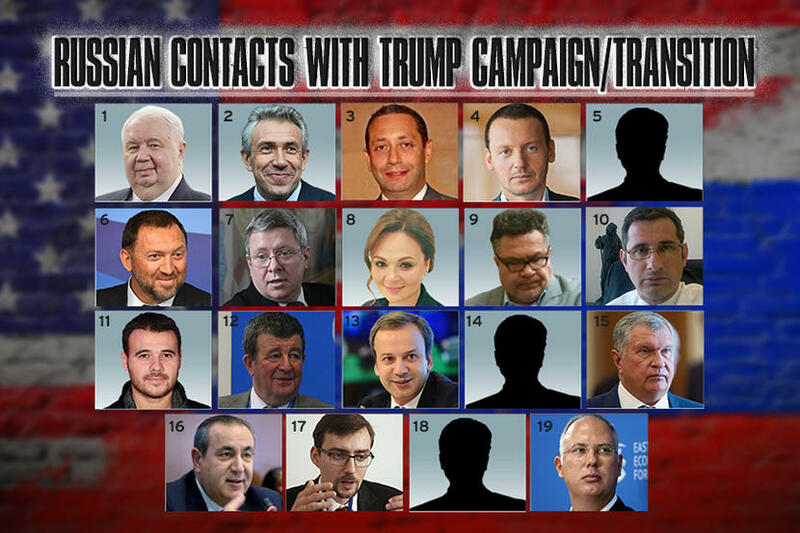 And it IS interesting how many contacts Kislyak was making inside the Trump campaign. He was one busy bee. Another Russian connection: Why did Trump try to appoint American oil industry consultant, real estate mogul and former reality TV star Carter Page from Merrill Lynch’s Moscow office to be a National Security Consultant to his campaign? Page not only criticized U.S. and NATO policy towards Russia, he did so from Moscow. The “Dixie Chicks” gotta be feeling the sting of that one. While no reported human or financial tie to Russia (yet), Trump’s Svengali, Steve Bannon, former head of Alt-Right racist conspiracy rag “Breitbart.com” who became Trump’s campaign manager and is now his Chief Political Strategist, is a self-described Leninist. In an interview with The Daily Beast, Bannon proudly claimed, “I’m a Leninist.” “Lenin,” he answered, “wanted to destroy the state, and that’s my goal too. I want to bring everything crashing down, and destroy all of today’s establishment.” Trump’s got his Putin man-crush. Bannon has Lenin. Felix Sater, a Russian-born businessman with Mafia connections and served time in jail for stabbing a man in the face with the stem of a margarita glass, approached Trump with a plan to license his name to build skyscrapers (including “a Trump tower on the site of an old pencil factory along the Moscow River”) across former Soviet-bloc nations, a few inside Russia, and in several U.S. cities with Trump’s name on them. The deal fell through but Trump and Sater remained friends. The Trump campaign denied knowing anything about Sater’s criminal past. Also part of the Trump/Sater scam, Tevfik Arif, another Russian real-estate mogul who served a 17-year career in the Soviet Ministry of Commerce and Trade. In 2005, Trump entered into an agreement with Russian financial group “Bayrock” to build “Trump Tower Moscow”. The deal failed, but his partner, Arif, moved into Trump Tower NY and took office two floors below The Trump Organization. Yet another Russian born real-estate mogul and business partner of Donald Trump is Alex Shnaider who partnered with Trump to build “Trump International Hotel and Tower” in Toronto. It may or may not be significant that Shnaider’s father-in-law, Boris J. Birshtein, is close friends with one of the heads of the Russian Mob [ibid “Soviet Ministry”.]. Among things Steele points out: It was barely 3 weeks after Paul Manafort took over running the Trump campaign in March of 2016 that Trump started trashing NATO (an alliance of Western nations to defend against Soviet/Russian expansion/militarism.) Russia has despised NATO and sought to destroy it since it was formed over a half century ago. (UPDATE #1: Not even 12 hours and we have our first update. Remember Trump’s pledge that the Keystone XL and Dakota Access Pipelines would be made exclusively using “American-made steel”? Well, scratch that. We have our first exemption and I’ll give you one guess who it benefits: 40% of the steel will now come from a Russian owned steel subsidiary operating in Canada. …whether or not the Trump campaign actively participated is still being investigated. UPDATE #23 – 7/8/17: Donald Trump Jr., son-in-law Jared Kushner and campaign manager Paul Manafort all met with Natallia Veselnitskaya, a Russian “adoption” lawyer with ties to the Kremlin, during campaign at Trump Tower in June of 2016. It seems unlikely the meeting with Veselnitskaya was arranged simply because she’s an “adoption” lawyer or why THREE high-profile members of the Trump campaign would concern themselves with “Russian/American adoptions” in the middle of a presidential campaign, but regardless, it’s just one more example of the Trump campaign denying contact with the Russians during the campaign that proves they were lying. This wasn’t an “accidental” encounter at a random event. This was in Trump Tower, and if it had anything to do with “adoption”, do you think they’d forget about it and not want to share that information? UPDATE #23b – 7/10/17: “Uday Bevis Donald Trump Jr, after claiming last March he never participated in any campaign-related meetings with Russian nationals, now admits he met with Veselnitskaya but claims it was to discuss “Adoption”. The New York Times is reporting Trump Jr. agreed to the meeting because he was promised “damaging information on Clinton” from Moscow. Agreeing to meet with a hostile foreign adversary to obtain information on your opponent is perhaps the VERY DEFINITION OF COLLUSION, and it is inconceivable Trump Sr was not aware of what his son, son-in-law and campaign manager were doing in Trump Tower one or two floors beneath his office. UPDATE #23c – 7/10/17: The likely REAL purpose of the meeting with Veselnitskaya? She is “best known for mounting a multipronged attack against the Magnitsky Act, an American law that blacklists suspected Russian human rights abusers.” The law… passed under Bush and continued under Obama… infuriates Putin and wants it repealed. Russia’s response to the law was to halt Russian/American adoptions. But to lift that, we would have to repeal the Magnitsky Act. UPDATE #23d – 7/14/17: The number of people on the Russia-side of the table in the meeting between Donald Trump Jr and Russian lawyer Veselnitskaya has grown to FOUR FIVE, including (Russian-born?) 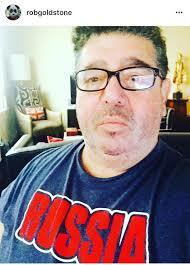 Russian/American (dual-citizenship) lobbyist Rinat Akhmetshin, British music publicist Rob Goldstone, former Russian counterintelligence officer “Anatoli Samachomov“, and now known Russian money-launderer “Ike Kaveladze“. Akhmetshin says Veselnitskaya invited him along because a client of hers was concerned that an American hedge fund which “seemed to be linked to the [Democratic National Committee] was violating Russian tax and securities law.” Clearly, “Russian/American adoption” was not the sole purpose Natallia arranged the meeting. Addendum: In 2008, Veselnitskya defended a man named Denis Katsyv, owner of “Prevezon Holdings” (see: #29) who was accused of laundering $230 Million dollars in Russia and ended up paying “Millions” in fines. So the presence of Kaveladze… with his own history on money laundering… at this meeting raises even more questions. UPDATE #24 – 7/13/17: May 2015, the NSA notices a spike in Russian chatter regarding Trump just before he announces his candidacy. May 2016, U.S. surveillance suggests Russian funds flowing to Trump campaign. UPDATE #25 – 7/19/17: Trump’s scheduled private meeting with Vladimir Putin at the G20 in Hamburg was scheduled for only 20 minutes but ended up lasting over an hour. 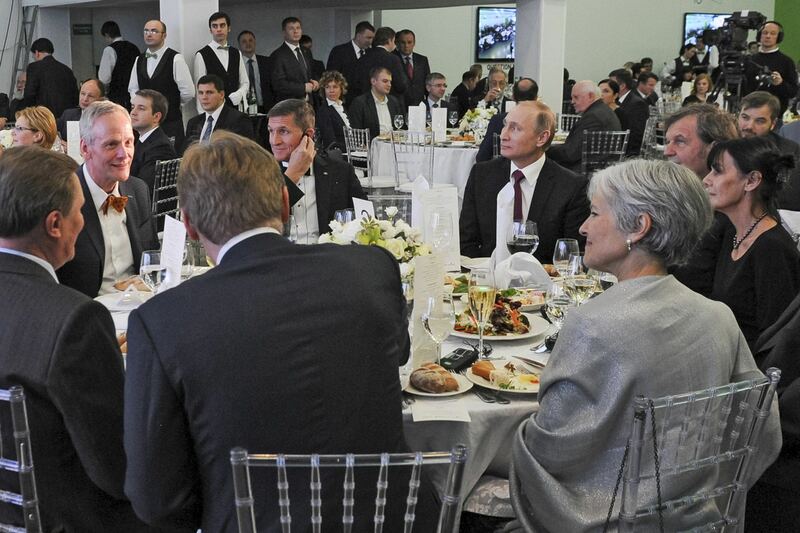 Today we learn that later during dinner (with a hundred other people present), Trump sat next to Putin and had a SECOND private chant with him that last *another* hour. Trump did not invite his own translator, relying on Putin’s own translator. 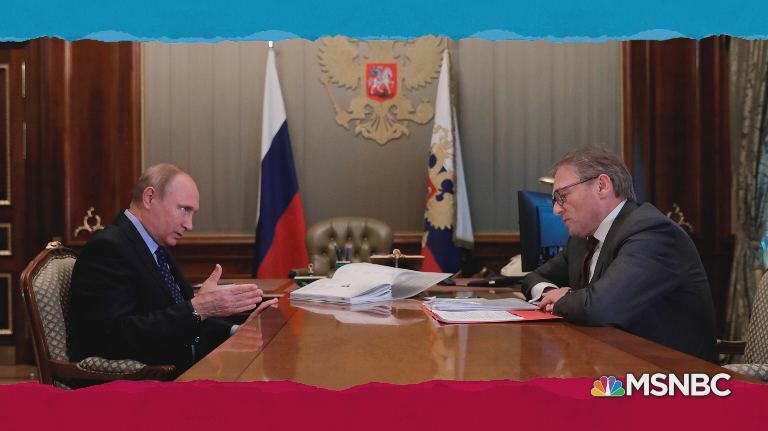 When news of the second private meeting was revealed, ONLY THE RUSSIANS spoke to the Press to describe the meeting and what was discussed. (After suspecting a bot attack on the Trump servers due to the amount of traffic) The researchers quickly dismissed their initial fear that the logs represented a malware attack. The communication wasn’t the work of bots. The irregular pattern of server lookups actually resembled the pattern of human conversation… conversations that began during office hours in New York and continued during office hours in Moscow. It dawned on the researchers that this wasn’t an attack, but a sustained relationship between a server registered to the Trump Organization and two servers registered to an entity called Alfa Bank. …When the researchers pinged the server, they received error messages. They concluded that the server was set to accept only incoming communication from a very small handful of IP addresses. UPDATE #27 – 7/27/17: In an update on 6/28/17 (above), I noted a link between Manfort’s Lobbying firm and “a Ukrainian oligarch named Dmytro Firtash in a plan to redevelop the famous Drake Hotel in New York.” Firtash “got his start in business with the permission of a notorious Russian crime lord.” That crime lord appears to be Russian billionaire Oleg Deripaska, who was paid $7.35 million toward management fees for Manafort and his partners in connection with an investment fund, according to a court filing in the Cayman Islands. Deripaska once was denied entry to the United States because of alleged mafia ties.” Firtash himself was indicted by the Justice Department in 2014 over bribery allegations in India and is now living in exile in Austria. UPDATE #28 – 7/27/17: Trump nominates “Brian Benczkowski” to be the new head of the Justice Department’s criminal division. Benczkowski’s lawfirm, “Kirkland & Ellis” where he is a partner, was hired to represent Russia’s “Alfa Bank” (see Update #26 above)… one of the largest banks in Russia… to “investigate” allegations Alfa’s servers were connected to the Trump campaign. Coincidence? UPDATE #29 – 7/27/17: In May, the Sessions Justice Department abruptly settled a lawsuit against Prevezon Holdings for a mere $6 Million with no admission of guilt. 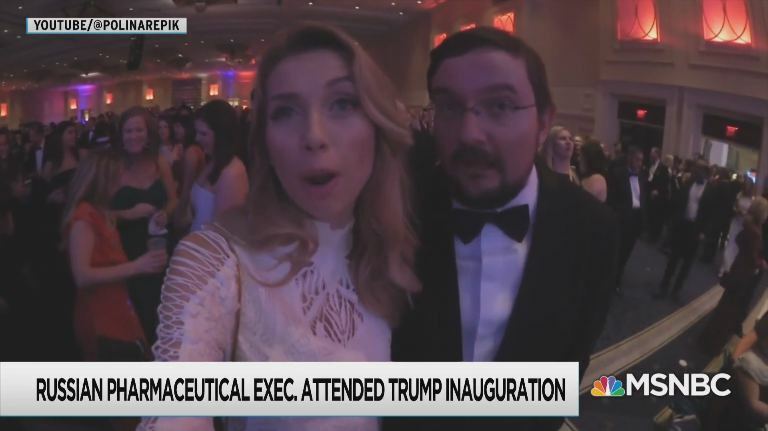 Prevezon stood accused of laundering $230 Million in Russian crime money through (Trump-owned?) real-estate investment in Manhattan (ibid: update #22b above). “Veselnitskaya represents the family of Pyotr Katsyv (ibid: Update #23), the former vice governor of the Moscow region, whose son, Denis, owns the real-estate company Prevezon.” Another coincidence? UPDATE #31b – 8/2/17: The New York Times is reporting Trump talked to Putin at the G20 “for nearly an hour” (Trump claimed “like 15 minutes”) regarding his son the day before Don Jr’s statement. During an interview, Trump *volunteered* that he (too) talked to Putin about “adoption” (to bolster his son’s claim?) and even referenced his son’s meeting despite not even being asked. UPDATE #32 – 8/29/17: The number of Russian-linked banks connected to Trump grows to 4. Sberbank (see update #18 Trump’s lawyer), AlfaBank (#26 “linked servers”), VEB (#5 Kushner & #7b Carter Page), Deutsche Bank (#2/2b German bank charged with laundering millions in Russian crime money and to whom Trump is deep in debt to the tune of hundreds of millions), and now “VTB Bank” (of which Russia owns 60.9%). Felix Sater (update #22) contacted Trump’s personal lawyer Michael Cohen in 2015 (during the campaign) on his efforts to finance “Trump Tower Moscow”, announcing “I will get Putin on this program and we will get Donald elected.”. Sater’s belief was that America seeing Trump negotiate a major real estate deal with one of America’s biggest enemies would show want an incredible negotiator & diplomat he was. The deal fell through and the Tower was never built. But this marks the fourth Russian-linked bank that was in contact with the Trump campaign and stood ready to loan Trump hundreds of millions of dollars. 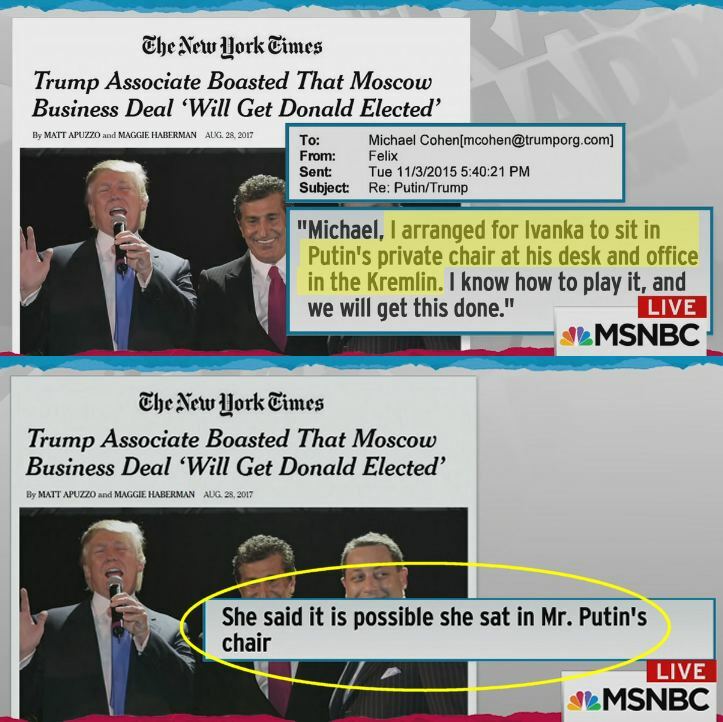 Cohen emailed Sater back, announcing he arranged for Trump’s daughter Ivanka to travel to Moscow to discuss the project and perhaps meet with Putin himself, even arranging for him to allow her to sit in Putin’s personal chair. Ivanka dismissed the idea that she was anything but a tourist while in Moscow, but conceded she “may” have sat in Putin’s chair. 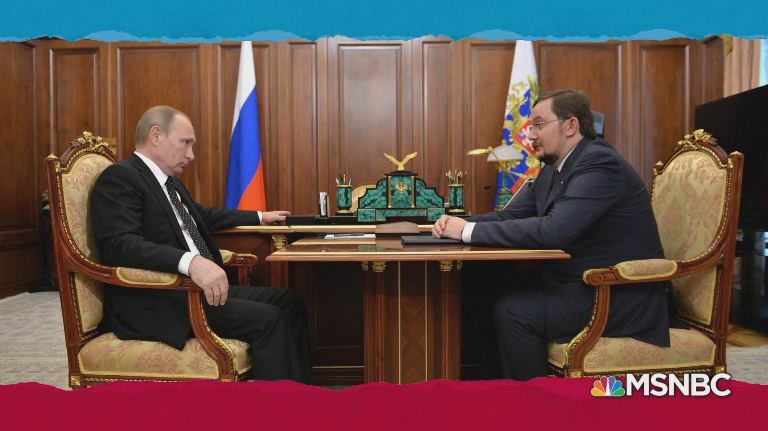 And how many “tourists” are invited to sit in the Russian presidents chair inside the Kremlin? Seriously. This also quashes any idea Cohen wasn’t an enthusiastic supporter of Sater’s plan and didn’t discuss it with members of the Trump family. UPDATE #32b – 8/29/17: The Washington Post reports that Cohen emailed one of Putin’s top aides, Dmitry Peskov, hoping (or so it appears) he could get Putin’s assistance in helping move the project along, telling him, “Over the past few months I have been working with a company based in Russia regarding the development of a Trump Tower” in Moscow, requesting a meeting with Peskov to “discuss specifics” and “arrange meetings with the individuals involved.” If you think Cohen did all this without the knowledge of Trump himself, trying to arrange a multi-million dollar hotel deal in Moscow and then stick his boss with the bill, in the middle of the presidential campaign when his boss is busily denying having any business dealings with Russia, you’re daft. UPDATE #33b – 9/13/17: Video of Trump at the 2013 Miss Universe pageant praising the Agalarov’s as “one of the great families in Russia”. UPDATE #34 – 9/21/17: The scrutiny of former campaign manager Paul Manafort has massively intensified in recent weeks, including reports of a no-knock 3AM raid on his home last August where investigators were given permission to “pick the lock” to enter his home to secure documents they feared Manafort might attempt to destroy if he knew investigators were about to enter. And no one has yet to explain why Trump appointed Manafort… a lobbyist for the Russian government’s interests in Ukraine, someone he did not know before the campaign (update: Manafort worked out of Trump Tower and was the business partner of long-time Trump friend Rodger Stone) and whom had NEVER run a political campaign before… was suddenly put in charge of the presidential campaign of a major party’s candidate for president of the United States. UPDATE #35 – 9/23/17: Manafort may have actually “encouraged” Russia to meddle in the 2016 presidential race. This might be connected to the recent revelation by Facebook that a Russian “Troll Farm” backed by the Kremlin purchased 3,000 ads between June 2015 and May 2017 that either promoted Donald Trump or attacked Hillary Clinton. UPDATE #35b – “BTA Bank“, the largest bank in Kazakhstan, was awash in scandal in 2009 when it was discovered that the banks’ chairman, Mukhtar Ablyazov, secretly directed between $8 & $12 Billion in loans to companies he personally had a stake in. Ablyazov fled the country and started using BTA to finance land development deals in Russian Georgia. In 2012, Trump flew to Georgia to secure hundreds of millions in loans from Ablyazov (who was evading arrest in several countries) to build another Trump Tower hotel there. The Tower was never built. It was all a massive money-laundering scheme where the bank sold $12 million in property through a series of shell corporations it personally owned, until eventually selling the property back to itself, under the guise of respectability by doing business with the likes of Donald Trump. UPDATE #36 – 8/16/17: Trump WH started pushing the claim “Hillary colluded with Ukraine” TWO DAYS BEFORE Russian hackers released a “hacked” email suggesting Hillary colluded with Ukraine. How did the Trump White House know what was coming? 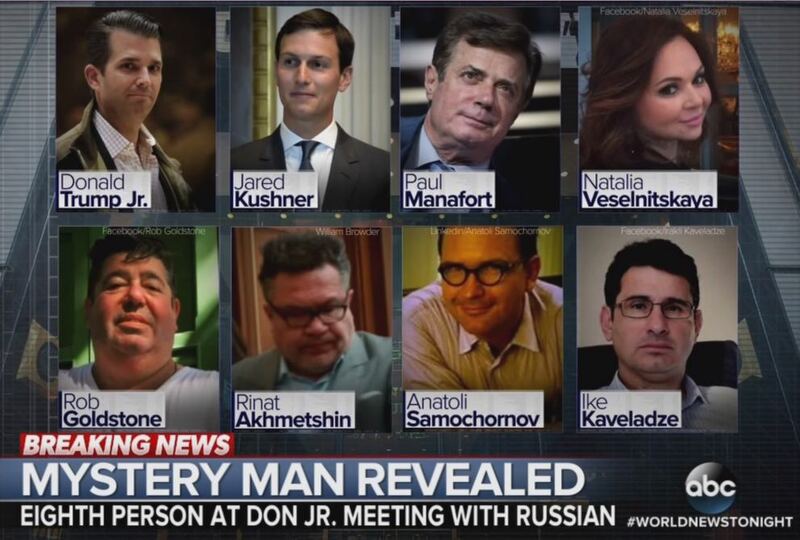 UPDATE #37 – 8/24/17: Rinat Akhmetshin (see #23d above), deputy head of Russian intelligence, who was invited by Veselnitskaya to meet with Don Jr in Trump Tower NYC with the promise of “dirt” on Hillary Clinton, controlled a team of Russian hackers. That meeting with Don Jr, Kushner & Manafort took place (“coincidentally”) just two/three days before the DNC was hacked. UPDATE #38 – 10/13/17: CBS News reports that the lawyer representing Russian real estate mogul Aras Agalarov (see Update #33) released a statement from his client noting that a newly released email from Russian lawyer Veselnitskaya (dated the day of her Trump Tower meeting with Don Jr which he agreed to three days before) makes no mention of “offering dirt on Hillary Clinton” and therefore proves he had “no involvement in Russian attempts to hack the election.” Aras’s lawyer? Scott Balber, Donald Trump’s former lawyer who sued comedian Bill Maher in 2013 for suggesting Trump’s father was an orangutan. On their own, these purchases appear benign… exactly how money laundering works. But nearly all of these purchases were “direct wire transfers” from his account at the “Bank of Cyprus” (Cyprus is an island nation off the coast of Turkey in the Mediterranean Sea) to a select group of Holding Companies in the United States over & over, paying the same holding company for “Home Improvement” as for “Men’s Clothing” and “Landscaping” totaling millions of dollars. And if that isn’t suspicious enough, as mentioned earlier, Wilbur Ross… Trump’s Secretary of Commerce… was the Vice-Chairman of the Russian-owned “Bank of Cyprus”. UPDATE #40 – 11/3/17: New York Times reports that Carter Page, Trump’s Foreign Policy Adviser, according to emails released by the House Intelligence Committee, notified the Trump campaign of his trip to Moscow in July of 2016 to meet with Russian officials. This is following the revelation that another Trump adviser, George Papadopoulos, ALSO informed the campaign of his meeting with Russian officials [ibid] for which he was praised, so all those times members of the Trump campaign said they knew of “no one” in the campaign who had been in contact with Russian officials, someone was lying. UPDATE #41 – 11/7/17: 13.4 Million (financial) records leaked from 19 off-shore tax havens, dubbed “The Paradise Papers” revealed that multi-billionaire Commerce Secretary Wilbur Ross (noted above as the Vice-Chairman of the Russian owned “Bank of Cyprus” before appointment by Trump) failed to disclose in his confirmation hearing that he has “a stake” (of undisclosed amount) in “Navigator Holdings”, that has received more than $68 Million in revenue since 2014 from Russian energy company “Silbur“, one of the largest gas companies in Russia, co-owned by the son-in-law of Russian President Vladimir Putin, “Kirill Shamalov”. Other Silbur stakeholders include “Gennady Timchenko” and “Leonid Mikhelson”. “Timchenko… was targeted by the U.S. and other Western nations for sanctions after Russia’s invasion of the Ukrainian region of Crimea in 2014” and “Mikhelson has also been sanctioned by the Treasury Department for propping up Putin’s rule.” (link.) Sibur’s main shareholder, Mikhelson, is Russia’s richest man. Ross’ stake in Navigator is estimated to be between $2-$10 Million, the result of a more than doubling in the stock value of Navigator Holdings buoyed by the shipping deal struck with “Silbur”. o J.D. Gordon, Trump’s national-security policy representative for the Republican National Convention, is the one who urged Trump to walk back the “pro-Ukraine” plank of the GOP platform which originally called for supporting the Ukrainian Army with “lethal defense weapons” to fend off the Russian military as it invaded that country to annex it. Gordon apparently did so after meeting with Russian Ambassador Kislyak AT the RNC Convention. UPDATE #45 – 12/05/17: The New York Times revealed evidence that former Trump campaign manager Paul Manafort was secretly co-writing (anonymously) an Op/Ed defending his work as a lobbyist for the Russian government in Ukraine. This would be an explicit violation of the gag-order placed upon him by the court as he attempts to influence public opinion ahead of his trial. Making matters worse, his co-author was Konstantin Kilimnik… who has ties to Russian intelligence and ran Manafort’s office in Kiev during the 10 years he did consulting work there. UPDATE #47 – 1/10/18: Last January, Trump’s lawyer Michael Cohen told Yahoo News that he had “no Russian/Kremlin connections”, but Miami reporter Grant Stern found the 2013 Russian announcement that Trump was bringing the Miss Universe pageant to Moscow, showing photos of Trump & Cohen having dinner in Moscow with Aras Agalarov (see Updates #33 & #38), the Russian billionaire whose Kremlin contacts were used to contact Don Jr regarding those hacked DNC emails. UPDATE #48 – 1/17/18: Glenn Simpson, the owner of “Fusion GPS” (the company that was hired by one of Trump’s GOP Primary rivals… unnamed, but which candidate had the deepest pockets and hated Trump enough to fund an investigation into Trump’s connections to the Russian criminal underworld, and would then hand off that investigation to the Clinton Campaign they later openly supported? Think: Jeb Bush), testified (pg.151) that back when he was still a reporter for the NY Times, he wrote about “Russian oligarch [Oleg Deripaska. See: Updates #27 & #34] having a meeting with Senator John McCain [and a separate meeting with] Paul Manafort shortly before the 2008 presidential election.” The plot thickens! UPDATE #49 – 1/18/18: The “House Intelligence Committee” released the transcript of their own interview of Glenn Simpson last November, where he testified on suspicious Russian real-estate purchases of Trump properties that were almost certainly by the Russian government/mafia as a way to help Donald Trump at a time when his credit was zero. At the height of the banking crisis when the real-estate market crashed, banks were denying credit for additional real-estate purchases (which can be a huge problem if you’re a real-estate mogul who has declared bankruptcy four times). But there was a loop hole that banks would still give you credit if you could prove your properties were “at least 80% full” of paying tenants. And Trump’s worldwide properties were just loaded with vacant apartments purchased by Russian mobsters (in no-questions-asked cash sales), ostensibly to help Trump meet that threshold so he could remain in business. UPDATE #50 – 1/19/18: We finally have some info on “Alexander Torshin“, listed above as one of the Russian businessmen linked to Trump. Did a top Russian banker with ties to the Kremlin illegally funnel money to the Trump campaign by way of the National Rifle Association? According to an investigation by “McClatchy DC”: Torshin, the deputy governor of Russia’s central bank who is known for his close relationships with both Russian President Vladimir Putin and the NRA, donated perhaps tens of millions of dollars to the NRA (the exact amount is unknown, but an amount believed to be between $20Million and $55Million), which then turned around and spent that money in support of Donald Trump. Total NRA spending on Trump’s behalf may be as high as $70 Million. UPDATE #52 – 3/5/18: Going back to THE VERY FIRST member of the Trump Campaign mentioned in this index, Rex Tillerson, the “New Yorker” magazine reporter Jane Mayer has learned that Russia nixed Trump’s consideration of Mitt Romney to be Secretary of State and instead suggested Tillerson… someone whom Trump had never met but was considered a friend of Putin/Russia. If you recall, I questioned at the time how someone like Tillerson… someone with NO political experience, didn’t know Trump and wasn’t on his “short-list” of SoS candidates, suddenly got the job without so much as a public dinner, mere hours after rejecting Romney. Now we know. (Tillerson seems to be serving exactly as desired, having been granted millions by Congress to “respond” to Russian misbehavior, but has yet to spend a single penny of those funds. UPDATE #53 – 3/6/18: George Nader, adviser to the United Arab Emirates’ Crown Prince Mohammed bin Zayed Al-Nahyan whom met with Erik Prince and Kirill Dmitriev in that mysterious January 2017 meeting in the Seychelles (see #8 & #43) to establish a “back-channel” line of communication between Trump and Putin, is now reportedly cooperating with the Mueller investigation and has testified before a Grand Jury regarding Russian meddling. Nader says Prince lied when he testified that the Seychelles/Russia meeting was all about his own personal business and had nothing to do with establishing a “back-channel” line of communication between the Trump Administration and Russia. What IS new is that SP Mueller has just subpoenaed The Trump Organization for any documents related to the “Trump Tower Moscow” project. Peter W. Smith – GOP operative actively contacting Russia looking for Clinton emails. Trump’s $100 Million dollar sweetheart deal selling a $40 Million dollar mansion to a Russian fertilizer billionaire who never even visited it only to later have it bulldozed for a $40 million dollar loss. Trump Campaign computer servers linked to “Alfa Bank”. Scott Balber, one of Trump’s personal lawyers, hired to represent Russian real estate mogul Aras Agalarov, accused of soliciting “dirt on Hillary Clinton” to Don Jr. I intend/expect to update this list frequently so bookmark it and return often. And if you know of any Trump/Russia contacts/associations I may have missed, I encourage you to please list them in the Comments. A German Twitter-tracking website, “Hamilton 68”, is monitoring the tweets of 600 known Russian bot/troll linked Twitter accounts and tracking what they (and their readers) are tweeting/retweeting. No surprise, they are uniformly pro-Trump and trying to discredit his critics. Most popular hashtag used by the Russian bots? #MAGA of course. Senator Lindsey Graham, in an interview on “Meet The Press” today, reveals that Trump now admits/concedes that “the Russians DID hack the DNC and stole emails.” Not only is that proof of meddling, but it’s also a crime Trump isn’t investigating/prosecuting. Every day I think I can’t be more stunned/horrified by this Administration. Then we learn things like this: Trump repeatedly “secretly” meets with Russian officials (though NOT secret in Russia), including inviting a Russian official *banned* from entering the country, TO THE WHITE HOUSE. National Security Advisor H.R. McMaster said Saturday that evidence of Russian interference in the 2016 U.S. election was “now really incontrovertible”. Trump’s response is to claim the timing of when that meddling began “totally exonerates” him. Not one word of concern about this attack on our democracy or taking any steps to prevent it from happening again. No, his only concern is to proclaim vindication. House Republicans shutdown the House Intelligence Commitee’s Russia investigation for “lack of evidence” (despite the Muller investigation is still ongoing and witnesses remaining to be interviewed). Trump fires Secretary of State Tillerson after he publicly concedes Russia was behind the attempted assassination of a former Russian double-agent in the UK (Skripal) and his daughter. Skirpal is linked to British Agent Chris Steele and the “Steele Dossier”. *Somebody* wants this investigation shutdown and Putin’s accusers silenced. I’ll give you one guess who. Trump once declared that if Mueller investigated Trump’s business, that would be crossing “a red line” (but never explaining what he meant by that.) Mueller has now subpoenaed Trump’s business interests regarding his attempts to construct “Trump Tower Moscow”. 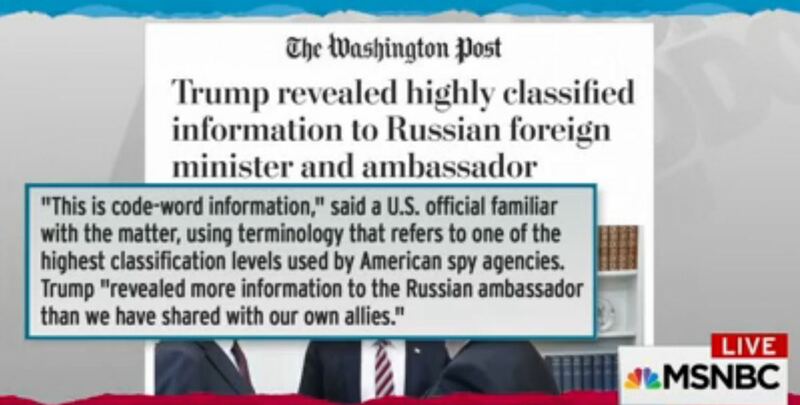 This is the first direct investigation of Trump himself and not just those connected to him. Back in February, Trump’s deputy campaign manager (and Manafort’s business partner) Rick Gates plead guilty to “money laundering, federal conspiracy and making false statements to the FBI” regarding contacting “Russian officials” during the campaign. Today (3/28), that “Russian official” (“Person A”) with whom Gates was “directly communicating” in September and October prior to the election was revealed to be Konstantin Kilimnik, Manafort’s Kiev-based former translator for the GRU (Russian Intelligence, formerly the KGB.) Kilimnik denies he is connected to the GRU. The contacts were revealed by Dutch Attorney Alex Van Der Zwaan, who pleaded guilty to lying to the FBI about knowing about Gate’s contacts with “Person A”, stating that Gates admitted (bragged) to him that “Person A” was a former Russian intelligence officer with the GRU. And that agent is now known to be Kilimnik… meaning Gates has contradicted Kilimnik’s claim of not working for Russian Intelligence, and confirms those contacts were still taking place in 2016 just prior to the election. In an interview with NBC News last Friday (4/27), Russian lawyer Veselnitskaya admitted she worked for the Russian government (something she previously denied.) Trump at a rally the next day seemed to validate the possibility during an attempt to criticize the interview, suggesting The Kremlin (whom she supposedly had no connection to) “called her” and requested she (falsely) claim to have a connection to them because Trump was supposedly “hurting them so bad” and needed to create chaos in the U.S..
I’ve said all along the goal of Russia has ALWAYS been to “create chaos in the U.S.” with their meddling in the election and getting someone like Trump elected president. How bout a January 2019 update on this article…any plans? I’ve pretty much suspended most of my work updating the site due to other priorities. I’m afraid I’ve fallen a bit too far behind to provide any more updates at this time, but I’m fairly confident not much has changed since the last update.